We are among the prestigious names in the industry, engaged in offering Idli Dosa Batter Filing Machine to our valuable customers. The offered filing machines are meticulously designed and are characterized by piston filing system, optimum filing accuracy and a compact design. These lightweight machines are easy to install and provide long-term service to the customers. PLC integrated MMl screen controlled system with production counter attachment for multiple filling. 24mm Dia to 100mm Dia/ Height 120mm Max. 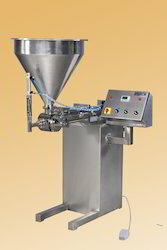 ± 0.5 to 1% Filling accuracy on single dose Depends of the nature of Batter. We are among the pioneers in the industry, engaged in manufacturing and supplying Rice Batter Filling Machine. These machines are designed by meticulous professionals using optimum quality materials and sophisticated technology. The offered machines are acknowledged for their short work cycles which helps the customers to attain maximum operational efficiency.